How do I enable API on my account? CallFire has a new API! We are proud to announce the launch of our API 2.0! Learn more about our streamlined, transactional and broadcast APIs. This version of the API documentation will remain available for reference only. There will be no new development, only bug fixes. We highly recommend upgrading to our newer and more sophisticated documentation. First, if you have yet to do so, log in to your CallFire account. Then, in the upper-right corner of the site, hover your mouse over your name, and click on Settings. Doing so takes you to the Account Settings page. Click on API Access in the left-hand column, and you will see the API Access page (shown below). Click on the Add API Access button. You will see the API Application Access pop-up box, as seen below. In the name box, enter an application name. Next, in the grey area, you’ll see an application login and application password that our system automatically generates for you. Please click on the clipboard icon, which copies this information onto your computer’s clipboard for you. You’ll then be able to copy and paste it into your application or document. This login and password allows your system to access and work with our system in the future. Agree to the Terms, and then click on the green SAVE button. 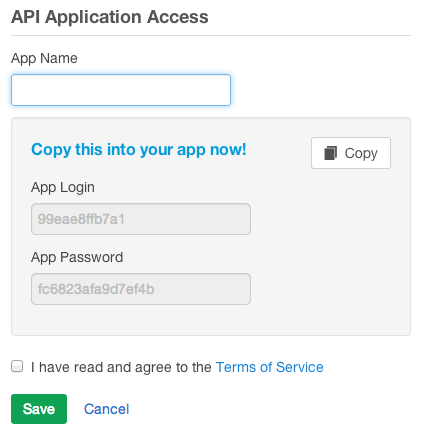 This takes you back to the API Access screen, where you will now see your application in the list box.